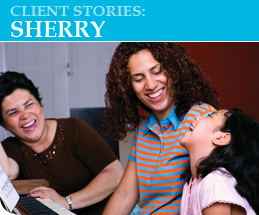 Sherry is a divorced mother raising her three children ages 9, 13 and 16 alone. She came to JFS for family counseling. Her oldest daughter is acting out in school, getting poor grades and staying out late. The middle child is very anxious and demands a lot of her time. The youngest, a boy, often has temper tantrums. Counseling has focused on teaching Sherry better parenting skills and having the children interact in more positive ways. All three children have been enrolled in our mentoring program and each have their own “grandparent/mentor” to spend time with. The family has been offered additional help in the community through participation in youth groups and summer camp at local synagogues. This will provide Sherry with much needed respite this summer. JFS offers counseling to individuals and families (including children), support groups, workshops, psychiatric assessment and medication management,psychological testing, mentoring programs and a free drop-in center for adults living with persistent mental illness and/or developmental disabilities. - Life and Relationship Skills Building. CONTACT 561-852-3333 for more information.